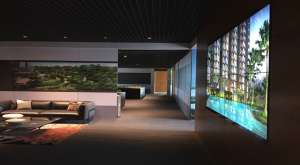 We provided Indiabulls 2 x 2 55” inch LG Full HD Videowall Screens with 3.5mm bezel size. Along with the screen we provided our robust and enterprise grade Wallflower Digital Signage Software and Branded Hardware with a Matrox graphics card installed to give a brilliant high resolution display output. The screens are installed and mounted in a specially made hollow polished wooden wall so the screen appears to be part of the wall. Hardware unit are concealed behind the screens and inside the wooden box so that no wires can be seen. Connected via a LAN, the Wallflower Software template designer was used to design a range of beautiful templates used to play Full HD content. Content Management & Scheduling is done remotely using systems accessing the hardware. The Wallflower software’s simple drag and drop feature allows the operational team to run & manage the videowall easily and effectively. Indiabulls Management is very pleased with the results of the 2×2 Videowall Display. 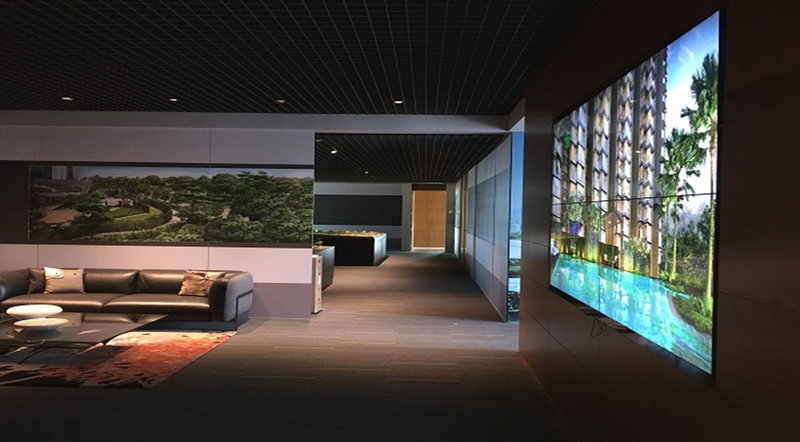 The impact of a Full HD 100+ inch Videowall on customers visiting the Indiabulls Sales office has created an overall “WOW” effect catching the eyes of clients and customers in their office and has helped in changing the entire look of their newly opened sales office.